The 1820s saw a growing concern with economic inequality, an anxiety commonly associated with the emergence of Jacksonian democracy. In New York City, these concerns were voiced by an anonymous pamphleteer known as “a new-york merchant.” He denounced the auctions of British dry goods that were a major part of New York City’s economy. He claimed that the “evil effects of the Auction System, upon the morals of the community, are so very evident, that it is hardly necessary to point them out.”1 According to this “merchant,” auctions were responsible for just about any evil that could possibly arise from market capitalism: they encouraged fraud, caused moral degeneracy, severed the bond between buyer and seller, stimulated dangerous speculation, obscured the “intrinsic value” of goods in the marketplace, fostered idleness, foisted shoddy goods upon unwitting consumers, inspired burglary and theft, and, most important in the minds of nineteenth-century New Yorkers, created monopolies. This pamphleteer was part of a vigorous anti-auction movement in New York City after the War of 1812 and before the Civil War.2 Were the accusations against auctions, particularly with regard to monopolies, empirically based? 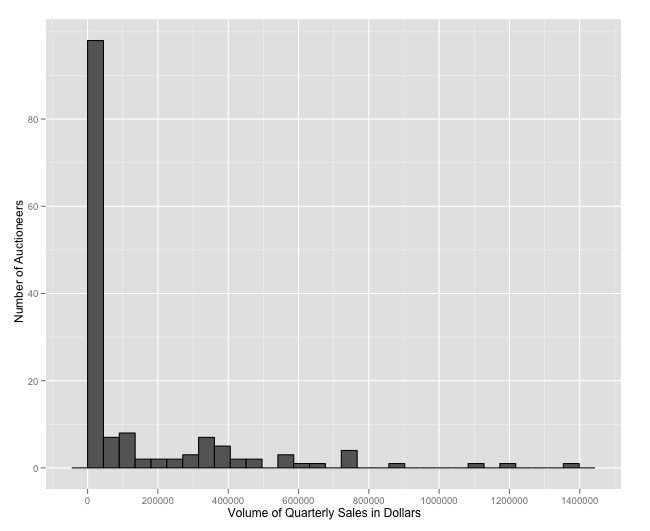 Data visualization can help the historian to understand why there was an anti-auction movement, whether its claims about New York auctions were empirically based, and how effective the movement was in stifling the business of auctioneers. Anti-auction discourse is best studied in conversation with the available economic data on auctioneers. The following graphs are based upon quarterly tax returns given to the Comptroller of New York from 1828 to 1832. Auctioneers were required to submit quarterly sales returns to the comptroller so that they could properly pay duties on the foreign goods they sold. Data visualization demonstrates that the anti-auction movement’s fear of monopoly was based in fact. 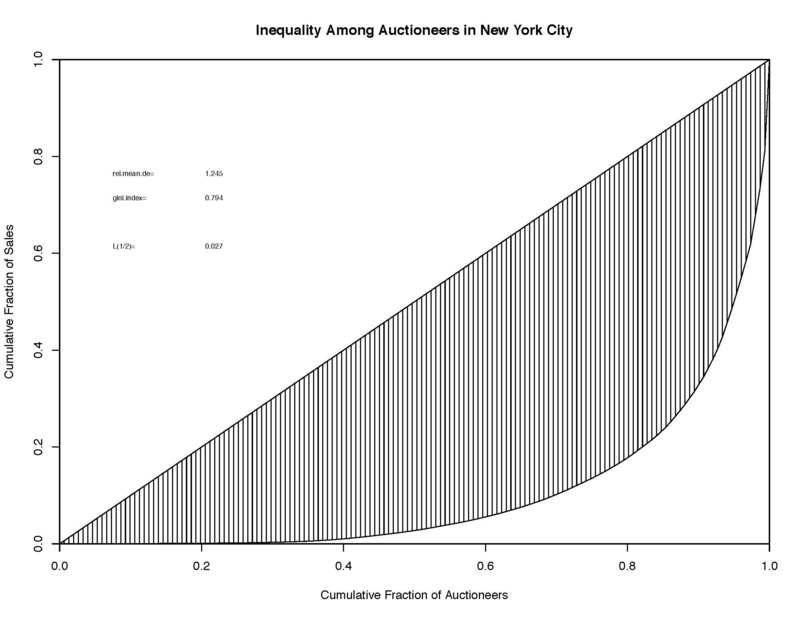 The data reveal a highly unequal distribution of sales among auctioneers: a few auctioneers sold a large volume of goods while most auctioneers sold only a few thousand dollars’ worth of goods per quarter. 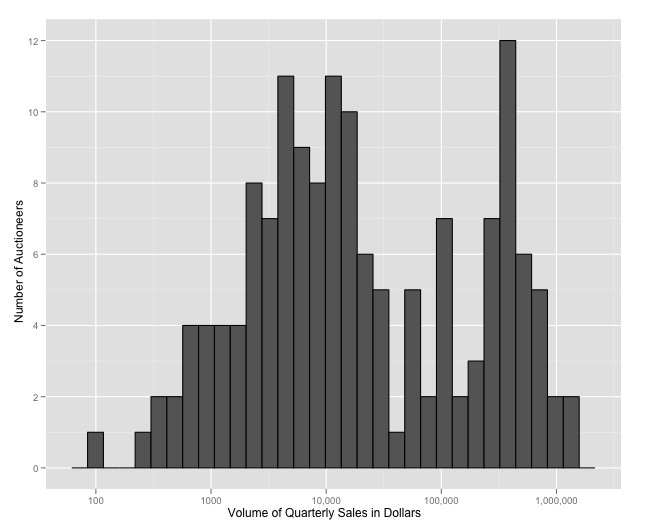 Figure 1 is a histogram of the quarterly tax returns. It reveals that most auctioneers sold less than $100,000 worth of goods per quarter. Indeed, the median quarterly return was only $13,093. The mean quarterly sale was $137,414, and the large gap between the mean and median is a product the extreme skew of the distribution. While most auctioneers sold less than $15,000 worth of goods per quarter, a few auctioneers sold over $1,000,000 worth of goods per quarter. One auctioneer, David Austin, sold 90 times more merchandise than the median with his quarterly return of $1,350,000. Figure 3 is also a histogram, but it follows a logarithmic scale. In a logarithmic scale, quantities increase exponentially: e.g., 10, 100, 1,000 instead of 1, 2, 3. Figure 3 most clearly illustrates the monopoly among auctioneers. Figure 3 reveals a bimodal distribution—two distinct bell curves. In Figure 3, there are two groups of auctioneers: an elite set of auctioneers and a non-elite set. With data visualization, we can see that the anti-auction movement was not misinformed or untruthful—at least with regard to the presence of the concentration of economic power among a few auctioneers. These stark inequities reveal the empirical bases of the anti-auction movement, but also suggest new questions. Were the other accusations made by anti-auction critics also empirically grounded? Did auctions encourage burglary or fraud? Were the goods sold at auction of inferior quality? Did auctions cause a decline in the ethical standards of business in New York? Or did the anti-auction movement fabricate some charges against auctions? Did the economic threat that auctions posed lead to a distorted view of auctions and their sales practices? In other words, did a rational response to monopoly lead to irrational fears of widespread moral degradation and fraud brought about by auctions? What types of goods did the elite auctioneers sell? Did they sell a particular type of goods? If so, what does this tell us? How were auctioneers affected by the anti-auction movement? Were elite auctioneers more affected than non-elite auctioneers or vice versa? Quantitative methods in the humanities can be used to raise new questions and spark further research, not just test hypotheses. 1. An Exposition of Some of the Evils Arising from the Auction System (New York: ? [around 1820], Van Pelt and Spear, 95 Pearl-street), 7. 2. Joanna Cohen, “‘The Right to Purchase Is as Free as the Right to Sell’: Defining Consumers as Citizens in the Auction-house Conflicts of the Early Republic,” Journal of the Early Republic 30 (2010): 25-62; Ira Cohen, “The Auction System in the Port of New York, 1817-1837,” Business History Review 45 (1971): 488-510; Joshua Greenberg, Advocating the Man: Masculinity, Organized Labor, and the Household in New York, 1800-1840 (New York: Columbia University Press, 2008), 52-55.